Price per bottle - 12.3 oz. Soak away your cares with our aromatic blend of legendary Dead Sea Salt, Lavender, and other essential oils. Since the time of the ancient Egyptians, people have traveled from all over the world to the Dead Sea for its reported therapeutic effects. Dead Sea Salt is excellent for soothing and rehydrating your skin. Lavender is a well-known herb in aromatherapy for its soothing properties. Aromatherapy with lavender and other essential oils has been shown to aid in sleep and relaxation. 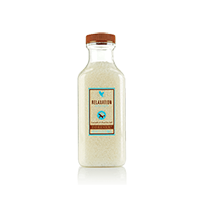 Forever Living has combined these two powerful ingredients in our Relaxation Bath Salts to create one of the most relaxing bath products on the market today. Just two tablespoons is all you need for a soothing, relaxing bathing experience you won’t forget! Just two tablespoons in your bath is all you need!